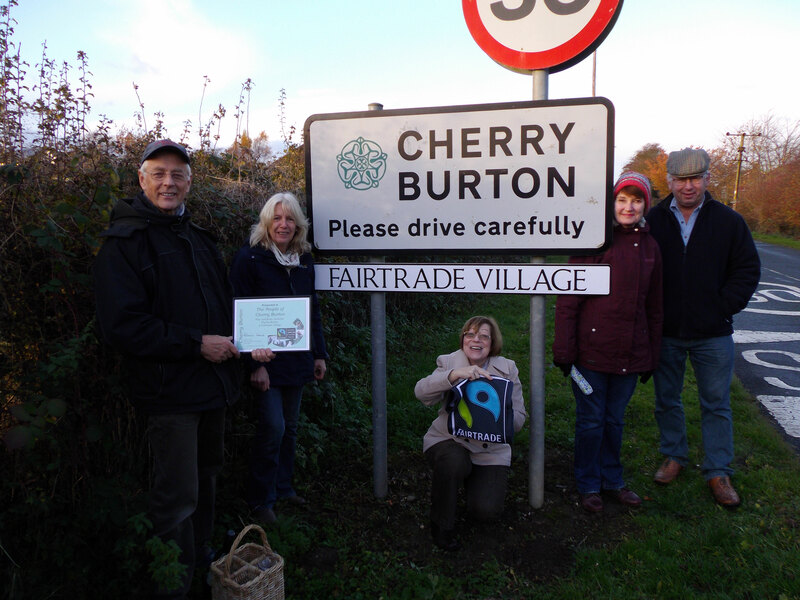 Campaigners in Cherry Burton are celebrating after “Fairtrade Village” signs were erected by the East Riding of Yorkshire Council on each of the four roads leading into the village. Thanks to the generous support of village-based businesses who funded the signs, the village now has visible reminders of its status for residents and visitors alike. Placing of the signs will fulfil the aim of raising awareness in the local community of the impact that choosing Fair Trade makes on people in the developing world. Cherry Burton has been a Fairtrade Village for 13 years, and was the first community in the East Riding to be awarded Fairtrade Village status. Widespread support by individuals, organisations and businesses has meant that status has been successfully maintained over the years. Business Sponsors included: Adrian Hedges of I Love Kitchens and Paul Grundy of Elm Tree Farm B & B; Mark and Jennene, The Bay Horse public house; Tom Ainley, plumber; Andrew Jeffrey, Kwikjet Cleaning Services; Kathryn Steels, North Bar Fabrics; Paul Staniford, Stanifords.com; and Pauline Greenwood, Burton Mount Country House. The Fairtrade Foundation is an independent certification body which licenses the use of the FAIRTRADE Mark on products which meet international Fairtrade standards. This independent consumer label appears on products to show that disadvantaged producers are getting a better deal from trade. Today, more than 1.6 million people – farmers and workers – across more than 74 developing countries benefit from the international Fairtrade system. Over 5,000 products have been licensed to carry the FAIRTRADE Mark including coffee, tea, herbal teas, chocolate, cocoa, sugar, bananas, grapes, pineapples, mangoes, grapefruit, lemons, oranges, satsumas, lychees, coconuts, dried fruit, juices, smoothies, biscuits, cakes & snacks, honey, jams & preserves, chutney & sauces, rice, quinoa, herbs & spices, seeds, nuts & nut oil, wines, rum, confectionary, muesli, cereal bars, yoghurt, ice-cream, flowers, sports balls, sugar body scrub and cotton products including clothing, homeware, cloth toys, cotton wool, olive oil, gold, silver and platinum. · The Council must pass a resolution supporting Fairtrade and serve Fairtrade coffee and tea in its meetings, offices, and canteens.